The J. Henry Company / TMC Group is a school and only a school! We provide classes to the Restoration and the Insurance Industries. It's time we view what we do as a craft. Our goal is to help you Master your craft. Our school will design programs to fit your needs. We can provide private classes just for your organization if requested. If you chose to sponsor a class, we will be happy to work with you. We pride ourselves in selling just Knowledge, not equipment or supplies. All your hopes, dreams, goals, and aspirations are amenable to hard work. The harder you work, the more successful you become. There are no shortcuts. Learn from the experts! You will not live long enough to figure it out all by yourself. Our goal is to help you get there. 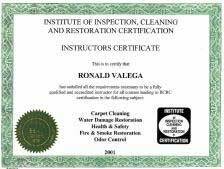 Ron became an approved instructor under the school of J. Henry & Company in 1998. Mr. Henry was Ron's instructor and mentor for several years. Ron purchased the company from Mr. Henry in the fall of 2001 and wanted to keep the name out of respect for his friend and mentor. Thus, the name J. Henry & Company / TMC Group. * In the Spring of 2002, Mr. Henry passed away after a courageous battle with cancer. To bring the Restoration Industry and the Insurance Industry together in understanding each others responsibilities. Treat our clients and staff with professional respect and courtesy. Follow the philosophy that our clients are the life of our business. Be considered a model corporation for other businesses in our community and our industry. Through our long-term commitment to this mission, our partners and our staff as well as our clients will experience continual growth in both their personal and their professional lives. Our goal is to change the paradigm between the restoration companies and the insurance companies. Kuhn, author of "Structure of Scientific Revolutions" said it best..."You must consider, when talking to a person with a different paradigm, that you are talking to a person with a different language. Until you can speak their language, you will not be able to communicate clearly. That is the Goal of TMC Group, Ltd.